The world of Redwall. - page 1 - general furry discussion - Furtopia | Family Friendly Furry Forum and IRC Chat! Any Redwall fans here? Raise your paw. I tried to get started into the Redwall book series long ago, but it didn't last very long. I had 4-5 books, but didn't get very far in reading them. Maybe at some point in the future, I'll try to get back into them again if I can. For now though, I recently checked out the complete Seasons 1, 2, and 3 of the Redwall animated tv series from my local library and have been watching that. Seasons 1 and 2 are done, so now I just have #3 left to watch. Anybody else a fan of Redwall? Have you read all the books and/or watched the tv series? What are your thoughts? What are your favorite books, stories, characters, etc.? I don't know about anybody else, but I am particuarly interested in seeing feature length movies made of the Redwall and Mattimeo books. And if successful, I think more movie adaptations could be done with other book titles. Only companies I can think of that could produce a movie series like this might be Disney and/or Pixar. And the animation/CGI would need to be spectacuarly photorealistic too. In my opinion, Redwall is long overdue to be made into a film series. In an age where all Hollywood cares about is reboot, reboot, and more reboots, or making more "sequels and prequels", I think Redwall would offer some fresh new storytelling to audiences everywhere. I would certainly rather see a new Redwall movie instead of another Fast and Furious #10 movie or another Jurassic Park #5 movie, etc., etc. Re: The world of Redwall. Read all the books. Absolutely loved them. Remain one of my favourite series. Don't own the books any more - My parents gave them away when I moved to uni. Seen the first series of the TV show. Honestly didn't think it was that great. Too many deviations from the book. Alright if you hadn't read the books, but not amazing if you were a huge fan of them. Not really fussed if they make a film of it or not. I doubt it will happen though. stoats, wildcats, water rats, birds, fish, snakes, lizards and others. to the enjoyment of the stories. stories from the middle ages. Swords, daggers, spears, slings and arrows, oh my. I did enjoy the series and plan to read them again. While we have the odd escaped colony of skunks, neither they nor groundhogs are native to the UK, and the odd escaped lot are not common by any means. Whereas we do have native lizards and snakes. Thanks for the info Loc.. Good reason for not encluding them. not following the story line harms the videos for those who have read the story first. ^ I just finished Season 3 today. The entire tv series isn't too terribly bad. I can understand it deviating from the books. It's hard to turn a book into a tv show/film. Not everything in the book can be condensed to fit into a certain amount of time. Certain scenes, characters, and situations have to be cut or re-arranged. But still, the series was decent nonetheless. It temporarily filled a gap for me until I am better able to collect the books and start reading them again. ^ You're probably right. It may not happen. But I can always be hopeful. Strange how most of the creatures in the Redwall series are mostly small. You rarely see or read about larger creatures. Kinda makes me wonder if Brian was biased towards smaller creatures in his stories? Were they just that much easier to write? And we don't have that much large wildlife native to Britain. About the biggest we have is deer, badgers and foxes. And the odd wildcat. And three of those are in the books. We've not even had wolves since about the late 1600s or so. Which is probably why he didn't write them in. vermin so they made good bad guys. creatures. I won't go into the story any more as to not ruin it for others. One thing that I was curious about and did a search for was "Redwall fursuits". I did a Google search, though not too extensive, and came upon one such image below. With all the diversity of Redwall stories, characters, and species, I think it would be great to see such fursuits at cons or even better yet, Ren Fairs! Heh, I'll raise four paws. Big fan here. While the books are formulaic, they're an easy fun read, and sometimes that's all I want to get away from the hustle and bustle of everyday life. Best books were the earlier ones--Mossflower, Martin the Warrior, Mattimeo. Most interesting ones were Taggerung and Outcast of Redwall because I felt for sure we'd see our first "bad" otter, and first "good" ferret. TV series...well season 1 they were finding their way, so yes, lots of changes to the story compared to the Redwall story. Season 2, Mattimeo was actually pretty close to the book so can't argue with not keeping to the original story. Season 3, Martin the Warrior, again very faithful to the book, so another good season. If people want to watch Redwall, they should skip the first season and actually watch the second two, just my take on it. The beautiful fursuit in the photo you found was made by a German LARPer by the name of Anja (aka Lepus discordia) . She's a wildly talented fusuit maker, who has created several beastfolk characters. 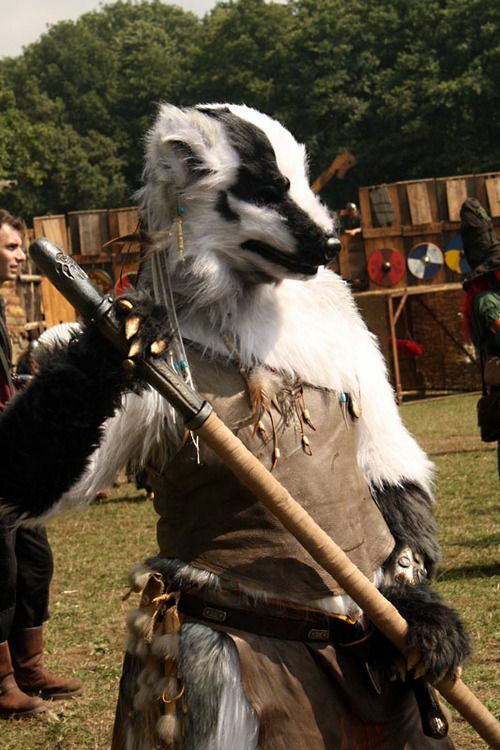 The badger in the picture is not a Redwall character, but one of her own LARP characters, called Taipa. The photo was shot at the annual "Conquest of Mythodea" LARP event in Hannover, Germany, 2012.
during which I also counted two cat-girls, a couple of foxes and a wolf. I don't know about ren-faires, but we were well received at Mythodea. I've only read one book, but I'm a huge fan of the show. My favorite character other then Matthias and Basil is Warbeak! I adore the sparrow queen and her mother Dunwing. found enoughh variations to keep them interesting. I once checked out a few at the library. Read em' all but I can't really say I'm a fan. Basically it leans heavily on one of my personal pet peeves, the always chaotic evil trope. Apparently in this universe if you're born as a certain species you're damned to be evil and hated. And if you're a certain other species you're good. They even go so far as to label all the evil species vermin. I don't believe any species is all good or all evil. A good example of a book series that avoids this trope is the animorphs series. The villains, the yeerks, are slimy sluglike body snatchers but once you get a few books in then it's shown that not all of them want any part of the whole body snatching everyone on earth plan. Many are just acting out of fear of execution and still others are actually working together with their human hosts in order to aid the main characters or hinder the whole earth invasion plot. The author basically took creatures that are essentially body snatching slugs and managed to make a few of them sympathetic. though the Stoat isn't good or bad. It's just trying to survive. of good and evil. Morality teaching is usually aimed at social norms. that why Brian chose them as being good. I was only exposed to the work through airing of the animated series on PBS here. I pitied the scarred fox character though he was evil. I have a good guy fox who lives with the sparrows. They raised him from a pup and even though he learned that he was a fox, he felt that in his heart he is a sparrow. There is a Redwall game in the works. There is a Redwall Muck too. A text based multi user RP game. I don't know how active it is, but it should be good for Redwall role playing. in our rp game section. Huge Redwall fan here. And I have passed down my love of Redwall to my niece who is not quite old enough to post in this forum. I remember that I once read a Redwall book when I was younger, I didn't even remember which book, that is about where it ended. Well until recently that is! Since college I got a little burned out reading. Always being "forced" to read technical literature at college and later at work, kind of burned me out. I had lost the love of reading, and was getting slower and slower and with less comprehension skills. I would skip lines, fall asleep, and basically couldn't read well anymore. But then, after joining Furtiopia, I was reminded about Redwall via this thread! Something told me to search my local thrift stores and libraries for used books for sale. Well, after a little while, I have amassed a partial collection! Now I have read 2 of the books, and it brought back good memories. I am quickly becoming a fan! The fact that perhaps the books were for younger people made it fun, and easier for me to read, which was exactly what I needed/wanted. Constance and Jess are two I would love to meet in real life! I wouldn't mind shaking paws with Folgrim myself. Mossflower and Salamandastron are two of my favorites out of the series. My brother turned me on to them in the late 90's, and we've both read all the way through Triss at least (he might have read further). This didn't guide me towards the furry fandom at a young age at all. Nope. Not one bit! It does amaze me a little that the redwall series wasn't made into a movie or animation earlier. When I read them that is what I do, visualize as much as I can to make them as real as I can. There is enough detail as far as I can see that they should lend themselves well to becoming a base for a script. Right? 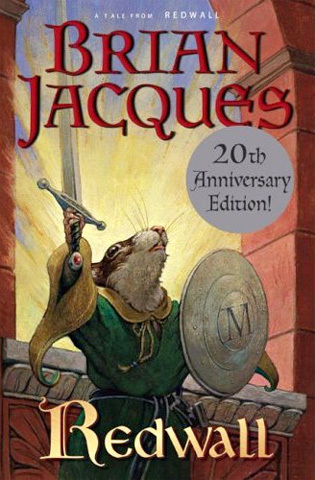 I would totally love to see a pixar rendition of redwall characters if they kept true to the books I have read so far. Perhaps I am not as "advanced" as some other readers when it comes to fiction, but I would say the books are for older kids for sure and teetering on the edge of adult, well for me anyway. Should keep people's interest. I remember watching Peter rabbit and Paddington in the theatre and there were plenty of adults there. And how many lord of the rings and Harry Potter fans are there who are adults. The more Redwall I read, the funner it gets. I do agree that all species should not be villianized just for them being born a specific way. In my neck of the woods some people think coyotes are vermin but I think that they are beautiful good creatures who are just trying to survive. But again this is a story book so I relax and accept it as it is.